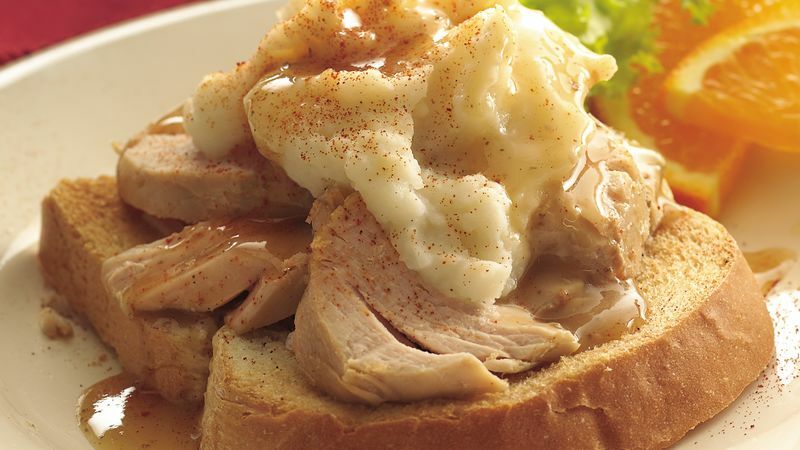 Place turkey in 3- to 4-quart slow cooker. Sprinkle with sage. Top with gravy. About 10 minutes before serving, cook mashed potatoes as directed on package for 3 servings. Remove turkey from cooker; place on cutting board. Cut turkey into 1/4-inch slices. Stir poultry seasoning and Worcestershire sauce into gravy in cooker. Place 2 pieces turkey on each toast slice. Top with 1/4 cup mashed potatoes. Spoon gravy over potatoes. Sprinkle with paprika. In place of potatoes, use stuffing. Use leftover mashed potatoes or Potato Buds® instant mashed potatoes in place of the frozen potatoes. Serve with a side of cranberry sauce.